Good evening everyone. I hope you all will join me in wearing a black armband and observing a moment of silence for the end of Eric Tangradi's tenure as a Pen. Seems like yesterday when he was the next great power forward. Alas. Tonight's preamble is a little shorter than normal due to the pain of no longer having Tangradi on the team. Around this time last week fans were planning the Cup parade, and then the Pens went and faceplanted in games against the Devils reminding them they are mortal. Personally, I blame Washington- their funk is apparently contagious. Whatever the case may be, the Pens are still fine despite their recent wobbles. More than ever the key is to get to playoffs relatively healthy. Getting Letang back on the ice will help greatly. It would also help if Malkin would cut down on the turnovers, or if Boychuk could bury a chance. Tonight's opponent is the Ottawa Senators, who the Pens dispatched a few weeks ago in a shootout win. They have the same number of points as the Pens so far so this will be a good test. Oddly enough it appears that if the playoffs ended today Ottawa would have the 5th seed and the Pens the 6th seed. This would set up a series with the Hurricanes, which would be pretty cool (and if the NHL learned from the NBA they woud rig things to set up this matchup). Philly would be out of the playoffs entirely, which cheers me. Should the Pens win, the board will lay fallow until the next game. Should the Pens lose, Shero will be excoriated for trading Big Dog and wrecking the chemistry of the team. Will be fun either way. Let's go Pens. I just tried to turn on ROOT and got nothing. I have Comcast in Washington PA, Anyone else having issues? offsides wrote: I just tried to turn on ROOT and got nothing. I have Comcast in Washington PA, Anyone else having issues? I guess it's just ROOT. I got everything else. pugilist13 wrote: I guess it's just ROOT. I got everything else. Both Niskanen and Letang are back, great! Mine started working. Good thing!! Jeffrey and Bortuzzo are the scratches. Gaucho wrote: Jeffrey and Bortuzzo are the scratches. As invisible as Jeffrey has been, I thought he created some offensive chances last game. Whats the defense pairings for tonight? or will Niskanen be paired with Tanger and their time will be limited. The Pens play better without Crosby than Letang. I have no stats to back that up, just a gut feeling. Glad he's back tonight. 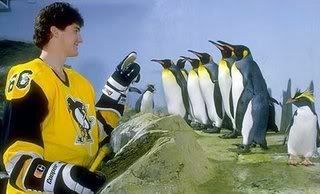 Finally, the Penguins lack of long glistening hair has been solved again. npv708 wrote: Whats the defense pairings for tonight?